The ultralight, breathable, durable Durastretch fabric of the Baranci DST Pant doesn’t shy away from sharp rock edges or a biting wind. Not only that, the close-to-the-body fit of the climbing pant offers convincingly great comfort, optimal freedom of movement and quick-drying ability. SALEWA has one goal- to produce the best possible product for every field of use. In cooperation with experienced alpinists like Reinhold Messner, Hans Kammerlander, Kurt Albert and Christoph Hainz, SALEWA has invented products which today represent the industry standard. The success story continues. Lukasz Dudek and Jacek Matuszek repeat Brento Centro! 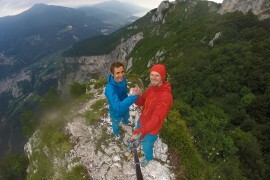 On June 29, at 7.20 pm, after two days of fighting their way up, Lukasz Dudek and Jacek Matuszek reached the top of Brento Centro (8b, 1000 m)!